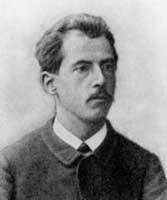 Hermann Kümmerly (1857–1905) studied Painting and was trained as a map painter. In 1884 he overtook the paternal company together with his brother Arnold. His relief map of Evolena–Zermatt–Monte Rosa (1891) in the SAC’s yearbook was seminal; Rudolf Leuzinger etched the map. Kümmerly became famous for his Swiss school wall map with modern relief depiction (1896). He and his brother-in-law Julius Frey, who joined the company as co-partner in 1898, thus rendered the company “Kümmerly+Frey” to the leading producer of school wall maps. 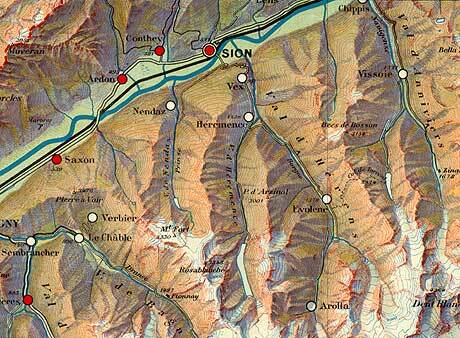 The school wall map of the Canton of Grisons (1902) is an especially beautiful example of felicitous relief depiction. “Schulwandkarte der Schweiz” (section Valais), original scale 1:200,000 by Hermann Kümmerly, 1896.